Europe is a fertile ground for shipbuilding, especially in the North, in countries such as the Netherlands, which is home to one of the most important builders of superyachts. An essential factor to the success of such brands is also the contribution by famous designers, who draw on their artistic abilities to create an exclusive and original style for every new project. 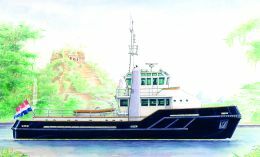 In the wide range of ships over 24 metres, a traditional or classic style does not necessarily entail an anonymous or uninspired design; on the contrary, if suitably exploited, references to past times can create a unique appeal. This is the case of Werner Yacht Design, a Dutch firm which has carried out several projects for ships from 15 to over 24 metres; the core of their research is the modern reassessment of stylistic elements from the past. In the field of yachting, Werner Yacht Design offers two very interesting, and in some ways innovative, projects. The first is the 80' "Flying Fortress", a yacht inspired by the design of the 1930s/early 1940s American Streamline Era. The result is a yacht with strong sports identifying elements, and whose design derives directly from that of the American B17 bomber, which at the time was precisely nicknamed "Flying Fortress". Such references are obvious, and can be observed by simply looking at its superstructure, with its small sharp windows and the round deckhouse astern. And we cannot help but to mention the air conveyors in the engine room, which are perfect replicas of those in the B17. To realize this project, Werner Yacht Design has developed two options: one with a structure in composite material, with mahogany finishings for the hull and a metallic silver colour for the superstructure; and one with a structure completely made of aluminium alloy. The second project is about an expedition yacht of 81', which has been created for adventurous owners who wish to discover every corner of the world, even if that entails sailing on internal or shallow waters. For this purpose, the Dutch shipbuilders have developed a hull which is able to sail even in extreme conditions, with a majestic bow able to break the highest waves, and a pilot house with a 360° view of the sea. For further information: Werner Yacht Design; Bouwen Loenstraat 13; 135 JC Edam; The Netherlands; tel. +31 (0)299 373813; fax +31 (0)299 373814; website www.werneryachtdesign.com; e-mail info@werneryachtdesign.com.